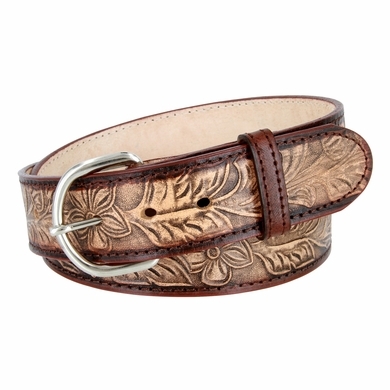 Western Tooled Floral Texture Plain Brown Leather Belt. 1-1/2" = 38mm wide Western Tooled Floral Texture Plain Brown Leather Belt. Simple Buckle for Easy Access and Maximum Comfort. Stitched Edges for Durability. 6 Holes for Easy Fit Adjustment. Stylish Nickel Plated Buckle with Matching Leather Keeper.